Soil Food Web – What’s All The Fuss About? 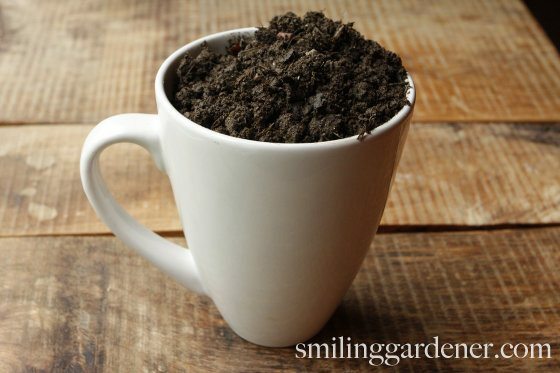 The soil food web refers to an army of tireless workers in the soil – 20,000 to 30,000 different species of soil organisms in a teaspoon of healthy soil. We call it a web to focus on not only the soil life, but more importantly on how they relate to each other, how they interact. There are 6 kingdoms of life: bacteria, archaea, fungi, protists, animals and plants. My focus tends to be as much on what they do as on what they look like. You may wonder why it’s so important to learn about all of this soil biology when you’re learning about organic gardening. It turns out they’re as important to the garden as the soil, fertilizer, water and everything else. 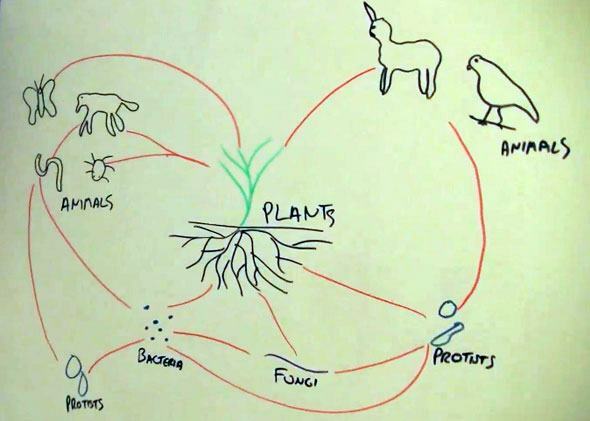 I hope this soil food web drawing helps explain in more detail what the food web is all about. Why Is The Soil Food Web So Important? Basically, these soil organisms the soil and maintain it. They build themselves villages, and they delegate tasks based on their individual strengths. Many are extremely small soil microbes, but despite their size they rule the world and they rule our organic gardens. They transform the minerals and organic matter in the soil into something that can support an abundance of life. Many nutrients won’t be taken up by plants until soil microorganisms have converted them to the right form. Some of them pull nitrogen out of the air and change it into a form that they, and plants, can use. Some bring nutrients directly to plants in exchange for food from those same plants. Without a vast array of soil biology players, we wouldn’t have soil. They also work to protect plants from plant-feeding predators, both in the soil and above ground. Some of them eat dead things and some of them eat living things and eventually they die themselves. All of this contributes to the organic matter and mineral content of our world. Yes, a few of these soil food web organisms also eat plants, but the vast majority are friends of plants just like the vast majority of bacteria in our body are friends of ours. If we use toxic chemical fertilizers or pesticides, or withhold water from the landscape (such as by using drip irrigation), or do a lot of deep rototilling or other soil disturbance, many of these soil food web organisms probably won’t be around for very long. Even if we do something seemingly benign, like use any of the horticultural soap products, we destroy many of them. We really, really want them to be around. Without them, our organic garden becomes a desert. Ultimately, that’s what this website is all about. Rather than thinking about taking care of our plants, it might be more appropriate to think about taking care of our soil biology, including our bacteria, fungi and protists – our soil microbes. Getting familiar with the soil food web is the first step towards creating a healthy garden. Some of our most important organic gardening tasks involve making sure we have enough soil microbes. Most of our other tasks involve making sure they have what they need, and those tasks are what I cover often on this site. When people talk about soil food webs, they’re referring to the (mostly tiny) inhabitants of the soil, and more specifically, the complex relationships between them (hence the word “web”). Here, I’m writing about the tiny soil organisms – the microorganisms. It turns out they have some very important jobs. They basically make the soil and maintain it. They transform the minerals and organic matter in the soil into something that can support an abundance of life. 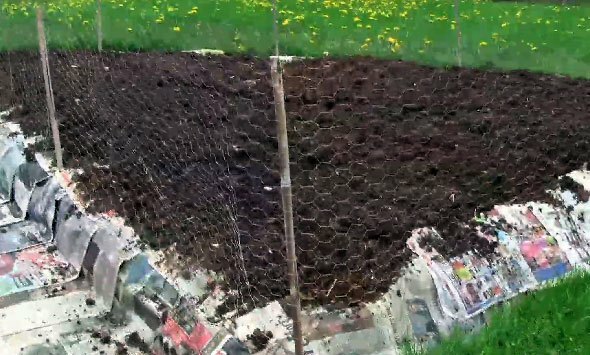 They rearrange soil particles to create good soil structure. Some microbes breathe air, just like us. They’re called aerobic microbes. Other microbes die in the presence of gaseous oxygen, so they live in places where there is none, such as deeper in the soil. They’re called anaerobic microbes, or anaerobes. Others switch between oxygen and other methods. Bacteria are the tiniest members of the soil food web. They are single-celled organisms – they each have just one cell. There are hundreds of millions of them in a gram of healthy compost, even a billion. Bacteria occupy the majority of the leaf and root surfaces of a plant. They break down simple substances and toxins and aggregate the basic building blocks of the soil. Fungi are another vital life form in the soil food web. They may be single-celled (such as the yeast that makes your bread, yogurt, wine and beer), or they may have billions of cells (like in a mushroom). A mushroom is the fruit of certain types of fungi, but the majority of those fungi’s biomass is actually underground, winding through the soil kind of like a microscopic root. They eat complex organic materials that most other living things can’t easily digest (such as lignin), and they harvest minerals from rocks that are virtually inaccessible to other organisms until released by the fungi (such as phosphorus). Like bacteria, fungi get food in the form of carbohydrates from the plants in exchange for their services. Protists are the outcasts in the soil food web, whose main distinguishing feature seems to be what they aren’t – they’re neither bacteria nor fungi nor animals nor plants. A protozoan can eat 10,000 bacteria in a day. During this process, nitrogen is converted to ammonium, upon which many of your plants will happily dine. We say that bacteria and fungi immobilize nutrients by storing them in their bodies, and then protists (along with other microbes, plants and animals) mineralize these nutrients – meaning they make them available again. Of course, many plants and animals are part of this food web, too. Here, I just want to make sure we’re all on the same page with the knowledge that it’s very important to take care of our soil food webs. Here are a few more articles about the soil food web. Using a soil inoculant may seem kind of unnatural, so let’s start with why it might be a good idea. The most important life forms in your garden are too small to see. Microbes cover every soil surface and even inhabit the insides of all larger organisms. They have a dramatic effect on plant health and nutrition, as well as our own. In most gardens, the microbiome has been thrown out of balance by things like tilling, chemical fertilizers and pesticides. I’ve been referring to Effective Microorganisms® (EM®) a fair amount on this blog, so I figure it’s time to get into more detail as to why it’s so incredible to use in organic gardening. 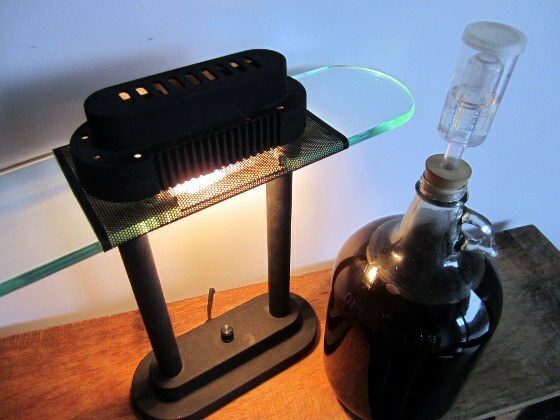 “Effective microorganisms” is a liquid culture of specific “facultative anaerobic” microbes that can provide amazing benefits for your organic garden when combined together in specific proportions.